Butter an 8 by 8-inch pan. Melt butter over medium heat in a heavy saucepan, add sugar and cook, stirring continuously, until mixture loses its grainy texture. Add almonds and continue to cook and stir. Don’t worry if the butter separates, mixtures will become thick and turn a deep amber color. It will then liquefy and being to smoke as it reaches the hard-crack stage (until mixture reaches hard-crack stage stage (320 degrees on candy thermometer). Immediately remove from heat and pour mixture into buttered pan. Melt chocolate in microwave or in double boiler. 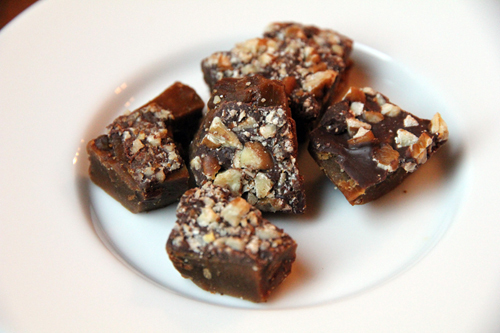 Pour over toffee. Sprinkle pecans over chocolate and press in gently. Allow toffee to cool until chocolate is set. Turn out and break into bite-size pieces. Store in air-tight container at room temperature.